Lorenzo Lotto was forgotten by art historians until the late 19th century. It was Berenson who rediscovered the artist and analysed his work and artistic personality in his monograph of 1895 in which he considered Lotto one of the most important painters of the first half of the 16th century. Lotto had a complex, difficult personality and spent the last years of his life as a lay brother in the monastery of the Holy House of Loreto. He trained in the style of the Venetian school and his work reveals the influence of Alvise Vivarini, Giovanni Bellini and Dürer. The subject of Saint Joseph and the Virgin’s Suitors is part of the story of the Marriage of the Virgin and is to be found in the Apocrypha, specifically the Apocryphal Gospel of Saint James, the Apocryphal Gospel of the Pseudo-Matthias and the Book of the Birth of the Virgin. Lotto depicts the moment when Saint Joseph’s staff bursts into flower. Following the apocryphal texts, at the age of fourteen Mary would have been obliged to leave the temple and marry, according to tradition. The priests who were entrusted with choosing her husband drew lots among the twelve tribes of Israel to chose the tribe to which the suitor would belong. For this reason they summoned all the bachelors and widows of the line of David to come to the temple bearing a staff. These staffs were collected by a priest before the prayers and were distributed among the suitors afterwards. As had been foretold, Joseph’s staff burst into flower and a dove sprang from it. 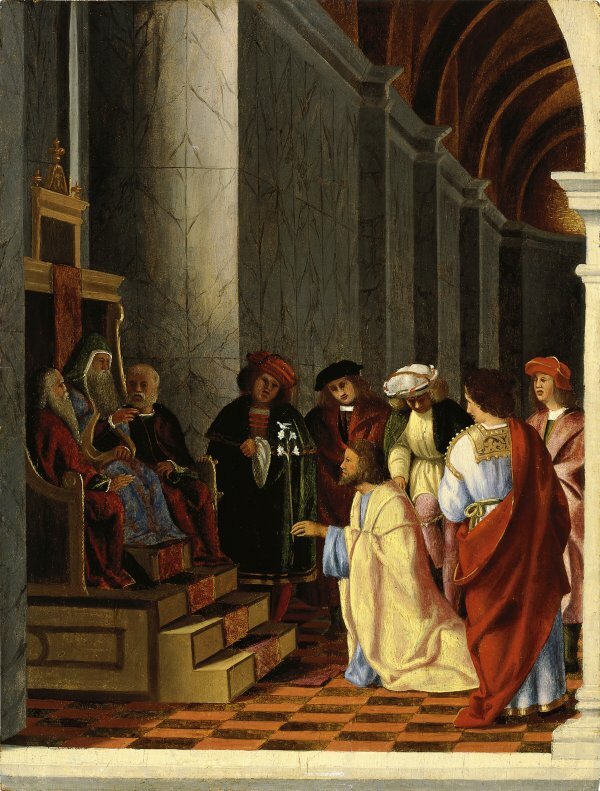 This is the moment depicted by Lotto, who depicts a bearded Saint Joseph, older than the other suitors as the apocryphal gospels state, kneeling and showing the High Priest the flowering staff on which the dove perches. The panel was acquired on the Italian art market in 1976. That same year Rodolfo Pallucchini examined it and confirmed the attribution in a report now in the Museum’s archives. From that point onwards it was included in the catalogues of the Collection as a work by Lotto. In his report Pallucchini dated the painting to around 1508, considering it an early work by Lotto. He compared it to Saint Dominic’s Sermon in Recanati (Kunsthistorisches Museum, Vienna), a panel that formed part of the predella of the polyptych, signed and dated 1508, on the life of Saint Dominic (Pinacoteca Comunale, Recanati). Pallucchini also considered the present panel to be earlier than the Transfiguration Altarpiece, now divided between the Pinacoteca Comunale, Recanati, the Pinacoteca di Brera, Milan and The Hermitage, St. Petersburg, in which Lotto’s style comes closer to that of Raphael.